For a few days, I will be taking a short sabbatical. My final paper is due next Tuesday and I haven't done as much as I should have (typical me... leaving boring things until the end). 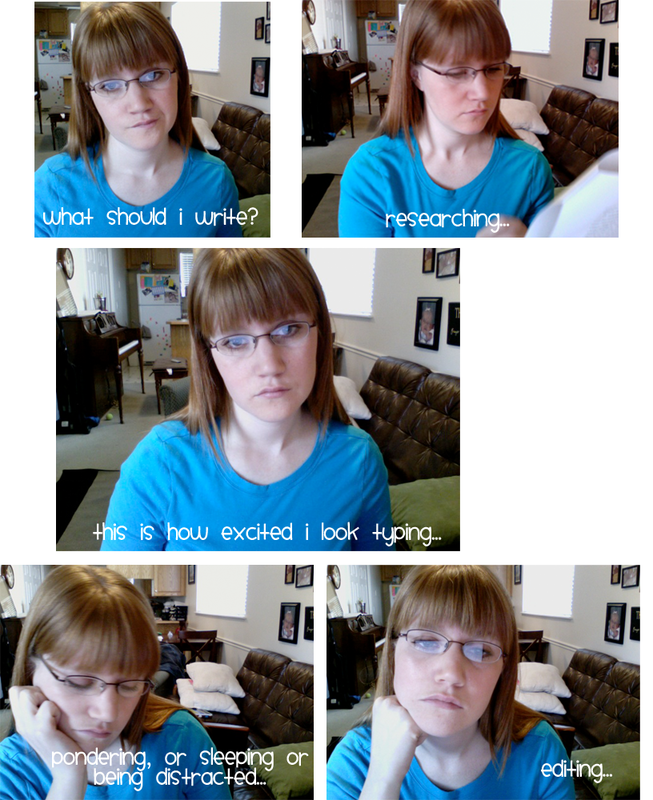 I won't be posting just for a few days to get my paper done and I might just take a day or so as a "breather." But I promise - you and I are going to be celebrating come April. Stay tuned! 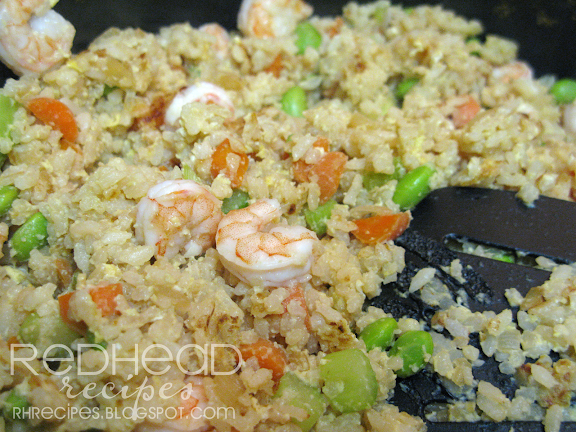 I love fried rice - not only is it a one-pot meal, but it is a clean-out-the-fridge meal. This recipe is more of a method. So adjust the ingredients to what you want. 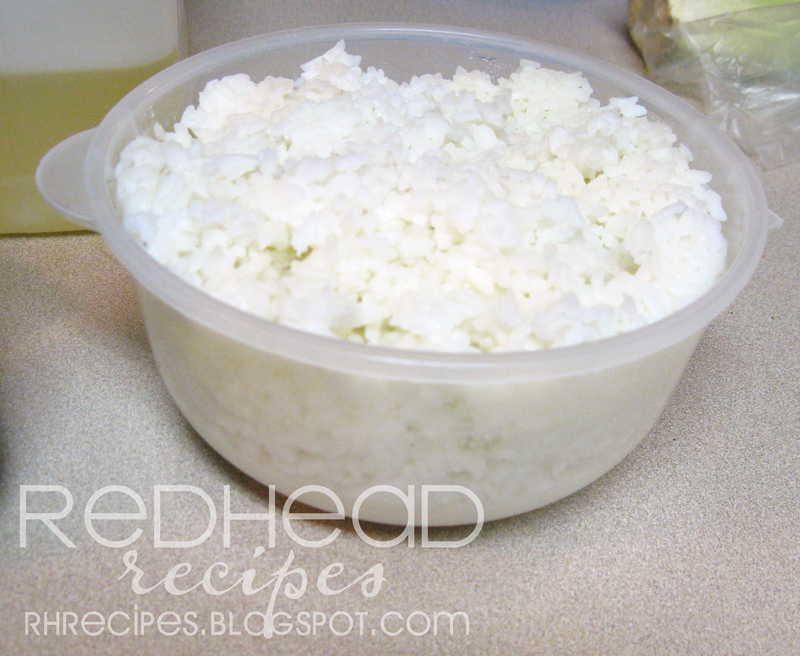 This was rice from our dinner a few days ago. 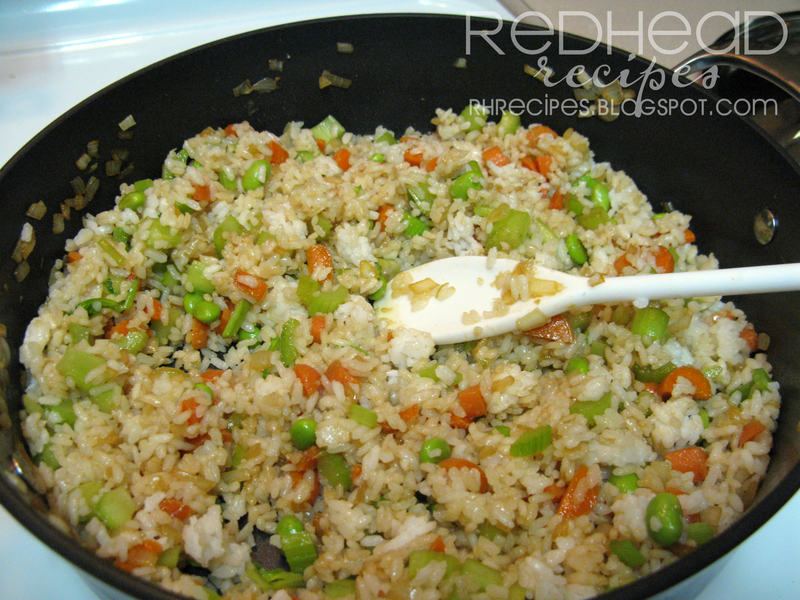 Add in rice and a few teaspoons of soy sauce and oyster sauce, stir for a minute. 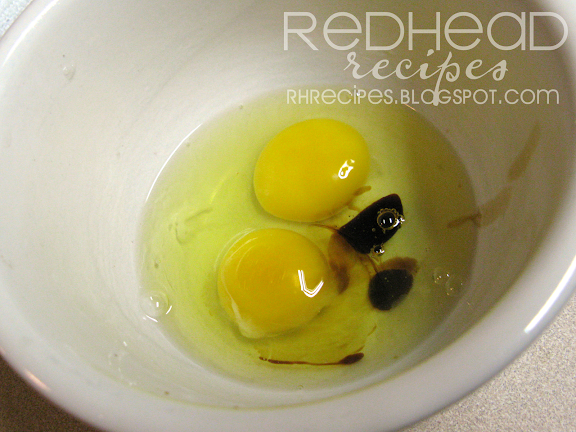 In a small bowl combine eggs and about 1 Tbsp of soy sauce (this replaces your salt to season), whisk together. Add to rice mixture and stir until eggs are cooked through. You never want to overcook shrimp so I added it raw at the end and cooked until it was just pink. See? Season with soy sauce and pepper if needed. Serve nice and hot. Garnish with green onions and cilantro if desired. 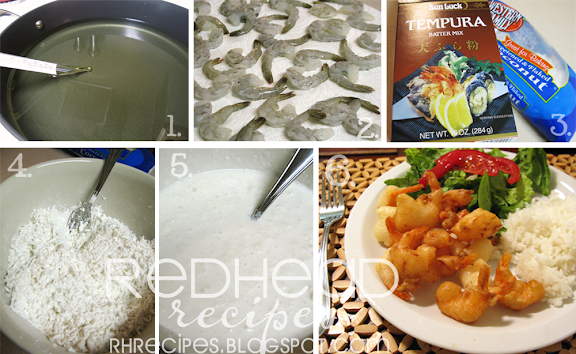 Now you don't have to use shrimp - use any protein. The protein may need to be handeled differently depending on what it is (use ham, chicken, beef, pork...). If it is cooked meat (ie leftovers - cleaning out fridge see? ), add at the end, after the eggs. 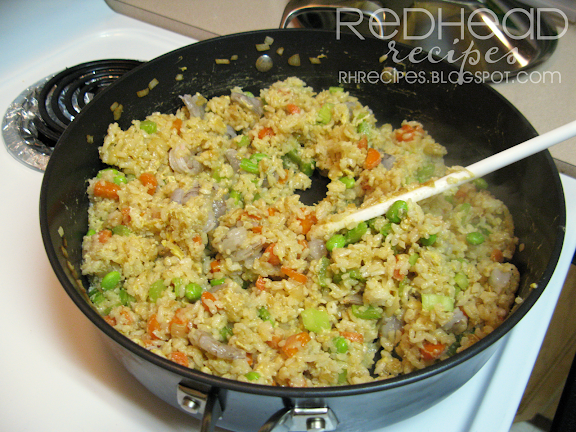 If it is raw meat, cook first, set aside then add in after the eggs. Today I am taking a break from my regular food-related posts to let you know about something just as good - service! 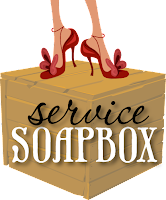 I have joined a committee called, "Service Soapbox." And we are hosting our first event - A baby shower! The March of Dimes has created a Teddy Bear Den Program (TBD) that is designed to encourage or motivate low income women to get prenatal care and practice healthy behaviors during pregnancy, as well as take good care of their babies after pregnancy. The TBD accomplishes this by offering women on the program incentives, such as diapers, wipes, new baby clothes and a variety of other baby care products. 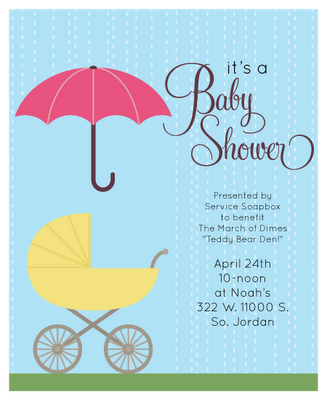 In honor of The Teddy Bear Den, "Service Soapbox" is throwing a Baby Shower! Guests who attend are asked to bring items to help stock the Den! Please look over this list and see what you can donate! Anyone can join in to support the efforts! Sign up HERE and participate in our "Virtual Baby Shower!" If you are an etsy shop owner, a children's retailer or a friend with a big heart and you want to send a gift for the event please jump on over, sign up and join in! Anyone who donates from out of town will be entered into our drawing for a chance to win some amazing prizes! You are now all officially invited! Come meet some amazing, fun, beautiful bloggers. Come enjoy great food, company, and even party games! I have been asked if we eat meals like my posts everyday. Certainly not. I would post a lot more often if we did. And, probably run out of ideas. I thought you may like to see what our "Everyday" meal looks like. It usually consists of three things - a protein, a starch, and a vegetable. Even if its a salad we usually have a protein on it (to keep us full longer and prevent me from eating 3 desserts instead of 1) and a peice of bread on the side. We like carbs in our house. Atkins is a swear word. 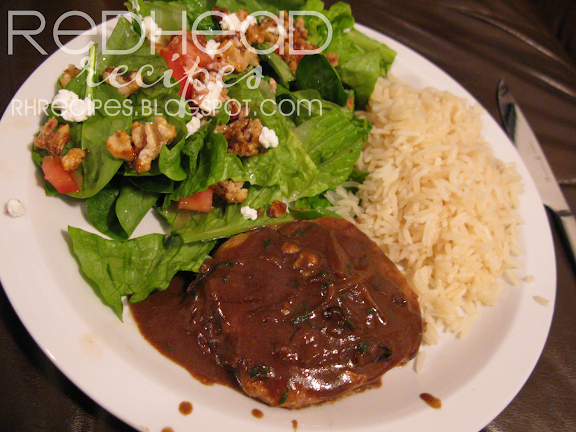 This meal consists of pork chop with a sauce similar to this, jasmine rice, and a salad with feta, tomatoes, and candied walnuts. Nothing fancy. Took me about 20 minutes to make. Are you less impressed with me? One of my favorite meals when I go to Hawaii is Macky's Coconut Shrimp. My mouth drools just thinking about it. I was having a little Spring fever and wanted something that reminded me of warmer weather. This is not quite like Macky's (nothing could ever be!) but it was simple and tied me over until my next trip out to the North Shore. 1. Heat oil to 350 degrees. Should have enough oil so that shrimp will be completely submerged. 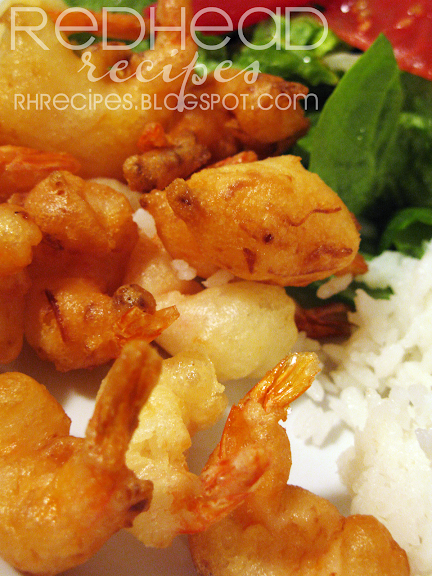 Dip shrimp in batter so evenly coated, place directly in oil. Do not put too many shrimp in your oil or the oil temperature will get too low (I keep my thermometer in to help me keep an eye on it). Fry until golden brown. Remove from oil and drain on paper towel for a minute. 6. Serve warm with favorite dipping sauce. 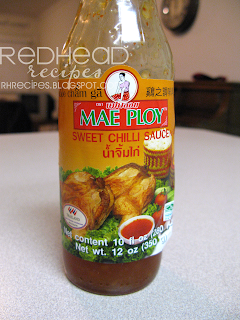 This is our favorite dipping sauce - it's what Maky uses. I buy it in Hawaii, so if you can't find it - choose something similar, or that you like. A couple years ago my sister and I decided to have a big St. Patrick's Day Party. We made Irish Food and I started St. Patrick's Gold Hunt. I hid rainbows throughout the house and they let to a pot of gold. My sister was nice enough to post a free print out of rainbows for you to use. Our "pot" broke (we used a witch's cauldron from Halloween), so this year it was a basket. We started out doing just gold-wrapped candies. 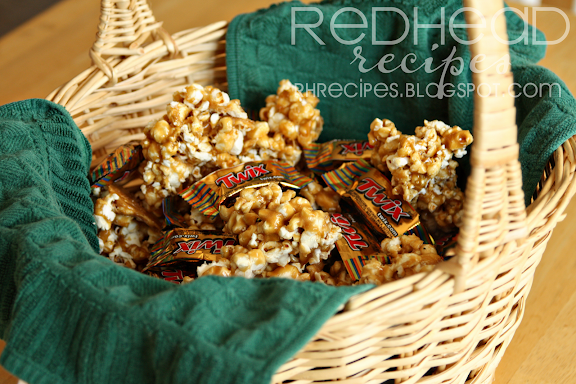 But this year I decided to make some "Golden" Popcorn. It was a big hit. 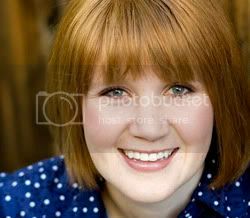 A few years ago my friend, Emily (pastry chef and mother of triplets, extraordinare!) introduced me and my sister to Irish Soda bread and Irish Beef Stew. 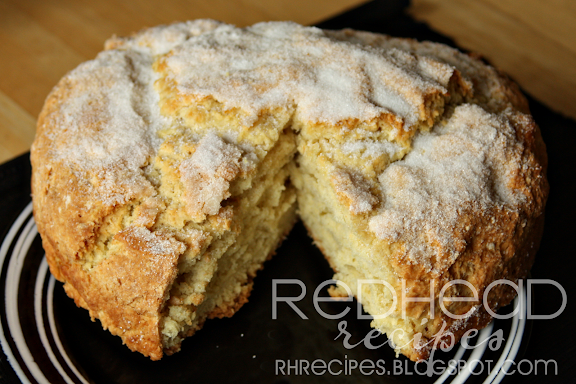 They are delicious recipes and have become a family tradition for us each year. Preheat oven to 375°F. Spray 8-inch-diameter cake pan with nonstick spray. Whisk flour, 1/4 c sugar, baking powder, salt, and baking soda in large bowl to blend. Add butter. Using fingertips, rub in until coarse meal forms. Make well in center of flour mixture. Add buttermilk. Gradually stir dry ingredients into milk to blend. Mix in raisins. I made this one with craisins, funny you can hardly see any. I thought it was delicious. But both ways are great! I love fondue parties. I think it is so much more social and comfortable than a normal dinner party. It's so fun to sit around the table, chatting and eating. 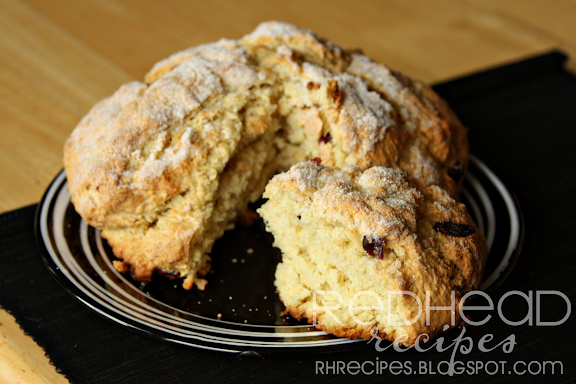 If you want a more formal dinner, have this for dessert to get things cozy before you pull out the board games. 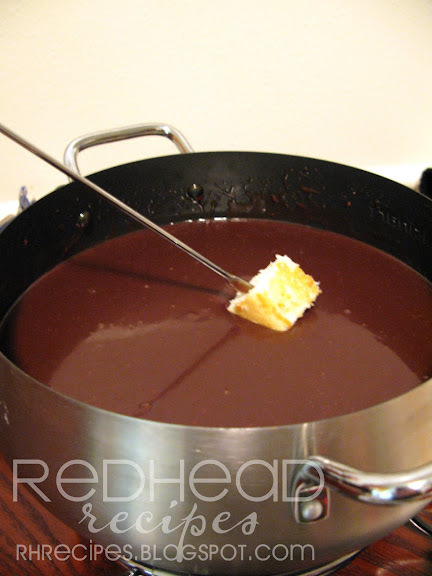 You are going to die (unless you already know) at how easy this chocolate fondue is. Basically it is just warm ganache. So don't throw away your leftovers! (Why were you thinking of throwing away chocolate?!) Warm it up and top you next cake with it, or ice cream, or use at room temperature for frosting or filling a cake, or put it on top of potato chips (the ruffly ones, I know what your thinking, but trust me), or eat it with a spoon like me and Lou do. Okay, enough of the tangent here is the recipe. Melt together in microwave safe bowl, stirring every 15 seconds, until melted. Transfer to fondue pot on low temperature. Dip in your favorites. *For a variation try adding cinnamon, or peanut butter; or replace the vanilla with mint extract, amaretto, or other extracts you like. 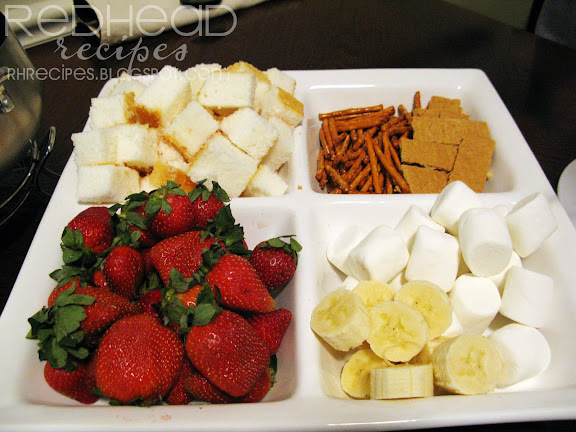 Some of my favorite dippers are pound cake (our store was out, so we went for angel food cake), pretzels, graham crackers, marshmallows, bananas, and of course - strawberries. 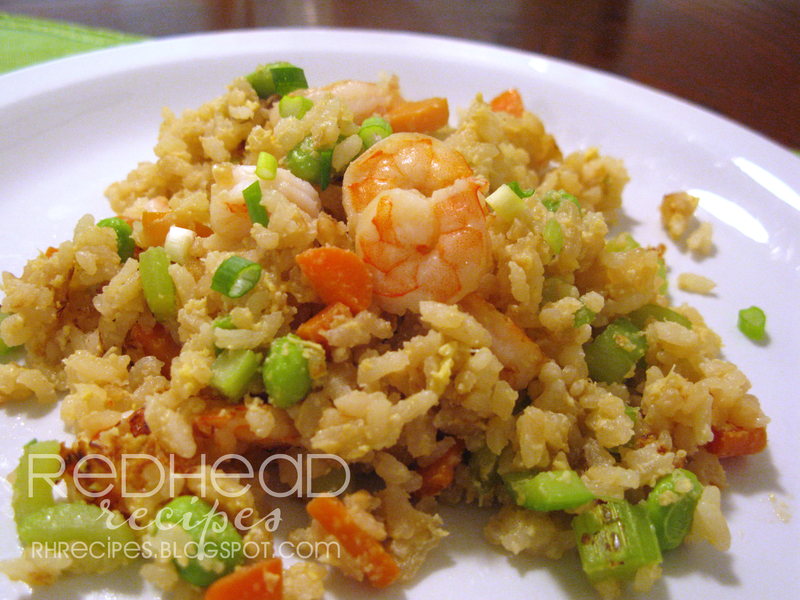 Need a simple, delicious dinner idea? Here you go! You're welcome. Actually, you can thank my friend Katy. Mmm. This one is so good. I think I need to make it again this week. Katy usually serves this with mashed potatoes or rice. 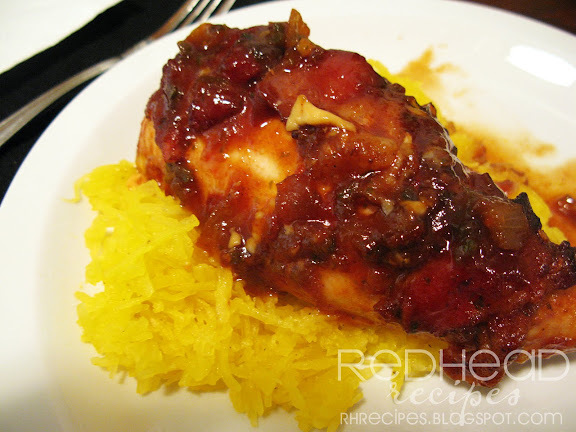 I thought it went deliciously with Spaghetti Squash. Do what you wish. Combine salsa, honey, vinegar, mustard, and molasses(or BBQ sauce). Fry bacon until brown, but not crispy. 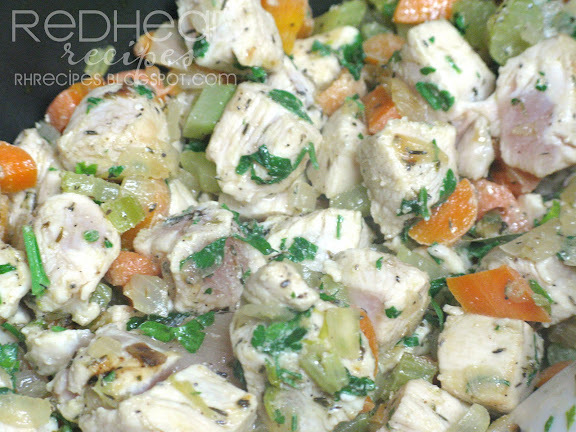 Place chicken in a Dutch oven or casserole dish and pour mixture over chicken. Place bacon pieces over chicken(or slice breasts and place bacon inside) and bake in oven until chicken is done(about 30 minutes, depending on thickness). Spoon mixture over chicken every 15 minutes. *Katy's Tip: For a variation, slice a pocket in the middle of each chicken breast and fill with cheese and pepperoni. Have you ever tried Couscous? I love it! Plus it is seriously ready in like 6 minutes. You can't beat that. Some grocery stores only have it in the boxes with the flavoring packets. If that's all - fine, you don't have to use the flabvring packet. My favorite place to buy it is at Sunflower Market in the bulk section - tons cheaper than the grocery store closer to my house. Oh, and a sweet, healthy bonus - I just found it in whole grain! 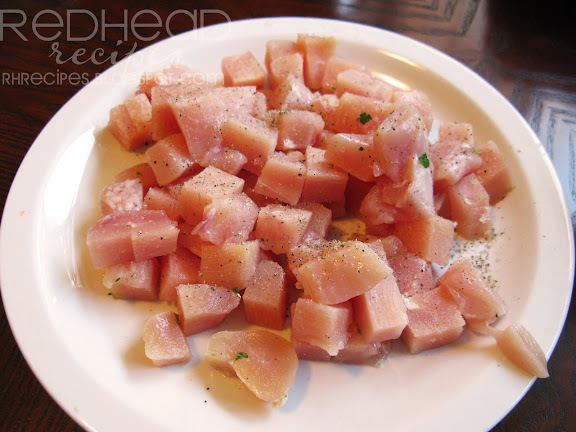 It is delicious alone or put in a salad. You can use it as a replacement for rice for lots of dishes, like curry. My husband loves rice (like, way too much) but after I introduced couscous, he likes it just as much. Boil 3 parts stock and/or water (I recommend stock). Add 2 parts couscous and a little drizzle of olive oil. Cover pot, turn off heat and let it sit for 5 minutes. Fluff with a fork. 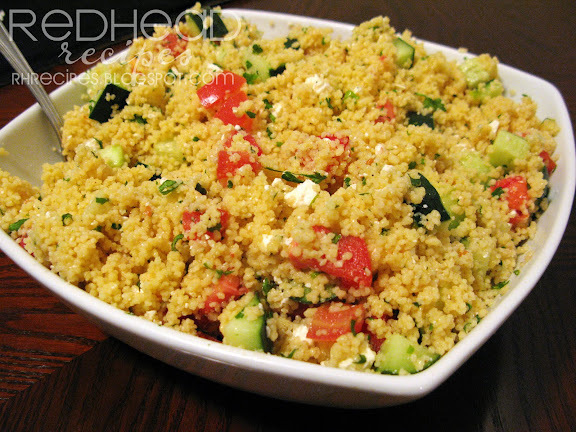 Here is what I did most recently with my couscous - a summery salad. It makes me feel better about the snow outside. 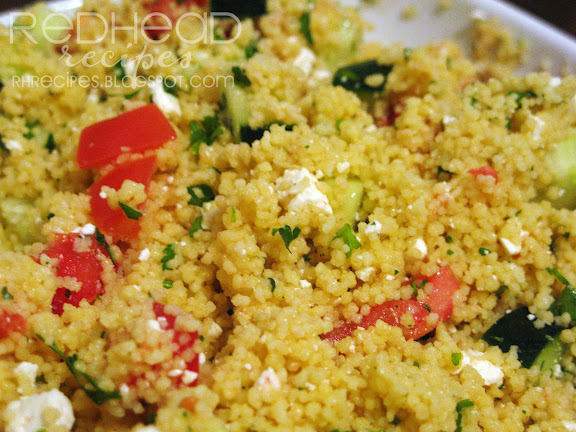 Combine couscous, tomatoes, cucumber, feta, and parsley. Add as much dressing as you like (I like mine on the dryer side). If you want, squeeze some fresh lemon juice. Toss. This recipe is for my dressing, don't use the whole thing for the salad. You will be sad. Save some for something else. 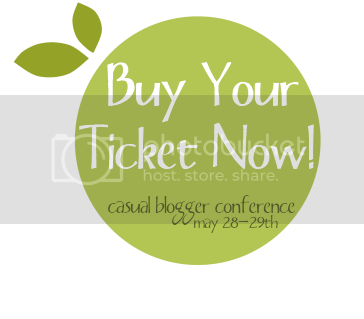 Have you heard about the Casual Blogger Conference? It's like those conference you see all the big bloggers attend and are having such a fun time-but it's for the casual blogger too. I am convinced it is going to be a party! Besides the fun, there are great classes to help you become a better blogger. Like? Learning about SEO, search engine optimization (how to get your post to the top of the google search! 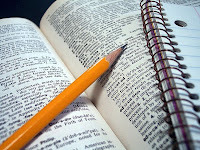 ); learning tricks of how to make money on your blog; and how to show your true voice. Besides the classes there are some fun bonuses - prizes to win, like a blog makeover for $300; a concert from Mindy Glehill; and swag galore. Click on the button on my side bar, then click "Buy Your Tickets Now!" I hope see you there! 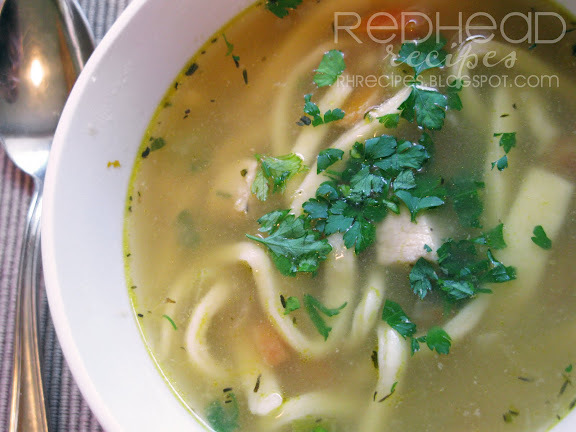 Chicken Noodle Soup is the ultimate comfort food for me. For some reason I used to think it was hard and time consuming. Really, it isn't that bad - and totally worth a few extra minutes to make your own noodles. 2 chicken breasts, cut into bite size pieces. Coat bottom of large stock pot with olive oil (a few Tbsp), heat over medium heat. Add carrots, onion, and celery (add more olive oil if vegetables start looking dry but aren't softened yet). 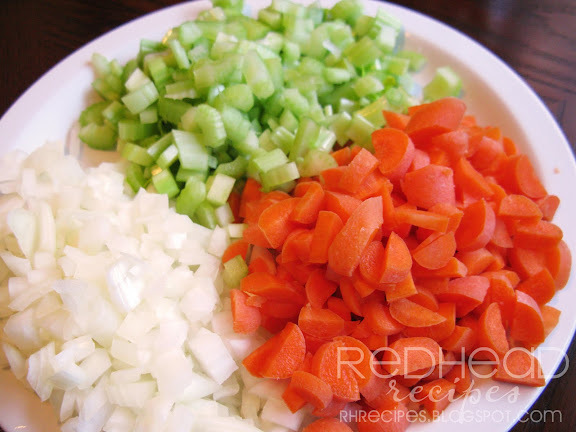 Saute until vegetables are softened and onions are transluscent. Add thyme, garlic bay leaf, salt and pepper. Saute for 3-5 minutes. Season chicken peices with a little salt and pepper. Add to pot. 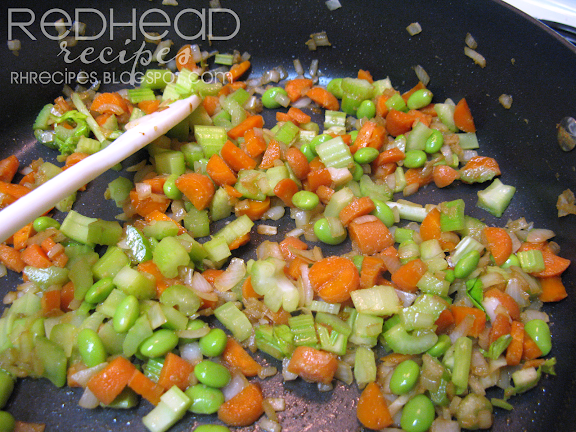 Let brown on both sides (will be about 1/2 way cooked - it doesn't matter if it is cooked through). Sorry this picture is a little blurry - but I wanted to show you that it doesn't have to be cooked fully. Add chicken stock, bring to boil. Taste broth, adjust seasoning as needed. Let simmer 30 minutes. Meanwhile - make the noodles. 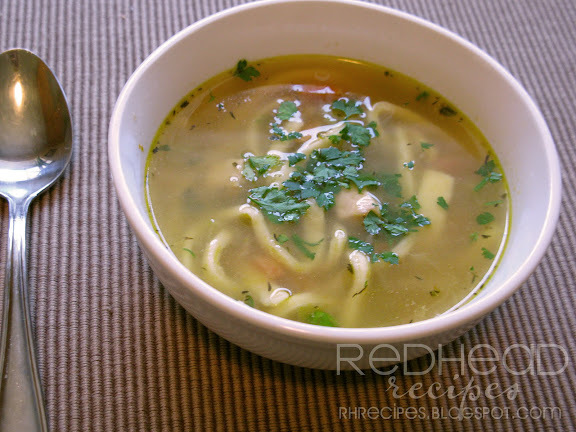 Bring soup back to a boil, add noodles, cook for about 5 minutes, or until cooked through (will depend on how thick your noodles are). Cut chicken while slightly frozen, it makes it easier. 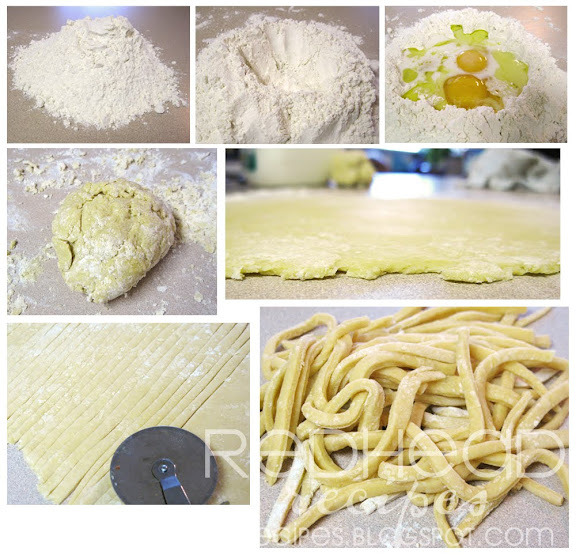 If you don't want to make your own noodles, cook seperately. That way they won't get super soggy when you store your leftovers.